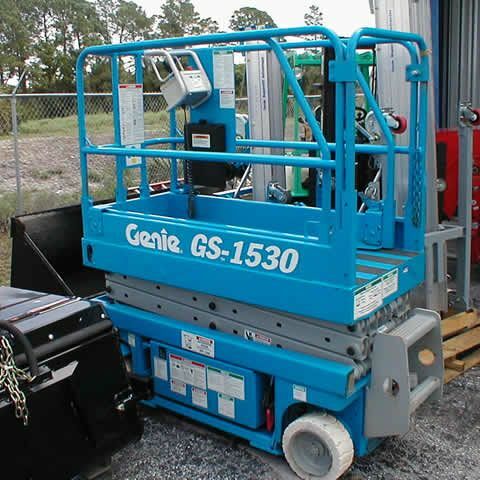 with a 21' working height and a 600 pound lift capacity this little scissor lift has the ability to help you reach your work with your tools without the inconvenience or danger of a ladder. Will it fit through a door? Yes, at only 30 inches wide and a stowed height of 6 foot 5 inches it will fit through a standard door. Exercise extra caution when traveling through doorways or buildings with low clearance. DO: Clear area of all debris and obstructions, lifts are meant to be operated on a perfectly level surface. DO: Check for overhead obstructions as well. DO: wear a safety harness at all time while operating the lift. Safety First! DON'T: drive over extension cords, boards, dirt, edges or any other uneven surface. DON'T: use a ladder or stand on guard rails, rails are designed for fall protection only. DON'T: attach ropes or chains to guardrails, or use as a crane. DON'T: operate in windy/gusty conditions or near moving vehicles.